I have not had time to update this page but since we have returned we have replaced the cracked corian counter top and replaced it with a crisp new white one. This really lightens up the galley and sets off the new faucet and the lovely new Anne Sacks tile backsplash. (See the more recent photos). Also since our return we have replaced all headliners, refinished all the floors and recovered all the seat cushions. 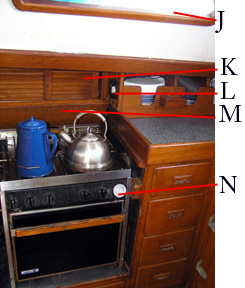 The U-shaped galley is good looking and functional with everything in arms reach. There are big lips on all the Corian counter tops, and the fold down tray, and the Gimbaled stove has pot holders on, all helping the chef maintain control on those bouncy healed over days. Safety first, the fire extinguisher, one of four on board, new 2003 is at "A". Storage for plates and cups is at "B" and more storage at "D" and "F". "C" is the access to the freezer and "G" and "H" the top and bottom fridge respectively with a clear view of its temperature at "E". We use the space between the companion way stairs and the fridge "I" for tray/cutting board storage and Kelly's block of chef's knives. Sorry these come home with us and yes we do stow them on potentially rough passages. 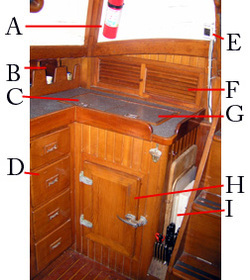 The sinks "S" are DEEP and great for throwing things in on passage when you quickly need a safe spot. 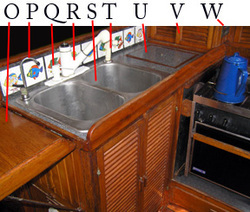 From the left we have a fold down tray "O", a drinking water faucet utilizing a pre-filter and an active carbon filter "P", a soap dispenser "Q". "R" is the main faucet this pulls out on a hose and the head has a spray button. "T" is a second spray hose except this is salt water for pre-washing the dishes. "U" and "V" are more storage locations, "U" being big enough to hold a few children and lastly "W" is the solenoid control switch for the propane. Not visible on this photo since it looks like I cropped it off, is a fan that sits where the "U" label is and is great for cooling either the chef or rotating and cooling the salon. Below the sink is a plastic coated set of wire shelves. They fit the space well and stored all out cleaning products however I am not sure until I remove everything if they are in a condition to remain on the boat as the plastic is chipped and rust showing beneath. I am sure a similar solution could be found to maximize the usage for the space. Next to the shelves we kept our trash can. Behind this is located our twin water filters, the pre-filter and an active carbon filter. There are 4 spares of each in the bottom shelf at the NavStation. The filters are mounted in the cupboard by a piece of metal that is rusting, this could either be stripped and painted or simply removed and discarded. To the left of the trash can is a multitude of hoses and valves. One of these is the vent for the water tanks (the only one with an extension hose clamped on so it can reach in the sink when filling the tanks) and all the others are related to the water maker. On the outside of the sink cupboards, below the fold out tray table are two AC outlets and an Air conditioning vent. To the left of the companion way steps is the wet locker, on top of this is a microwave. 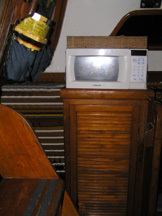 On top of the microwave is a woven fruit basket. I am a month into this passage right now and am craving the days when this had fruit in it, the only thing fresh I have left is half a cabbage. Note the EPIRB directly by the exit.